I can still remember it like it was yesterday. I was sitting in the church bus wishing everyone would just ride already so we can head home. A non-descript lady in her forties entered and sat across from me. She looked at me and smiled. I was in my early teens, awkward and shy, so I just tentatively smiled back and looked down. She then said something I wouldn’t forget. “Did you know you’re beautiful? “she asked in Chinese Fookien. I was shocked, caught in an amalgam of jumbled emotions; feeling flattered, embarassed and weirded out all at once, as everyone else turned towards us. “No, really, I find you so beautiful.” She added in a motherly tone. “You should fix your hair to show off your beautiful face.” I don’t remember being able to say anything back, but profusely blush in my seat and smile in return. I got off from the bus half an hour later with the widest smile in my heart. I knew it was a simple compliment from a woman I didn’t even know. But for a girl who was made to feel like she was too tall, too fat and too manly to be described as beautiful, it was a message that definitively changed her perspective. For the first time in many years, I looked in the mirror and didn’t instinctively find flaws. With curious, searching eyes, I realized that the face looking back was beautiful. words can either make or break somebody's day, indeed! Everyone is beautiful in their own special way. Abi, you are certainly a beautiful lady. 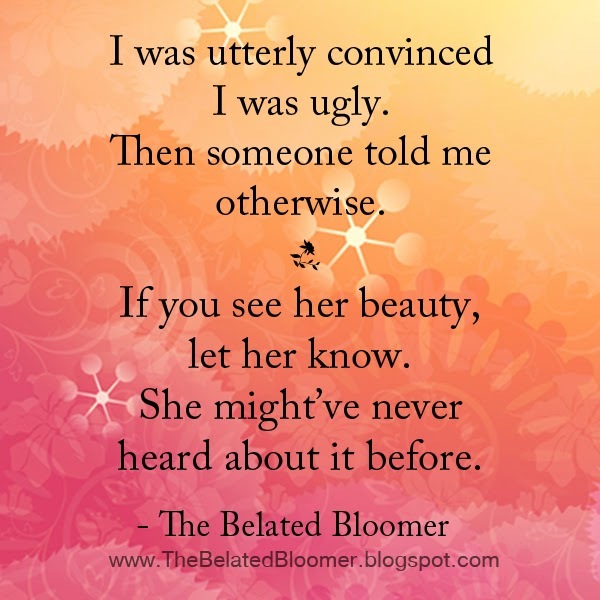 It is because of your beauty- outside and within- as to why I keep coming back to "The Belated Bloomer." I once did a blog post in my main blog about the power of words. And believe me, words can heal as much as they could be used to hurt. Very true words you have expressed in this blog post. Thanks John! I do believe in the power of words. This is so heartwarming and beautiful. It really reminded me to give someone a compliment - it's a small action but to the receiver it may just be etched in their memory forever. Thank you so much for writing this! I noticed that too. Strangers tend to be much more expressive in terms of dishing out compliments or encouraging words. :) Thanks Kristine! Such a gorgeous quote. Thanks for sharing the inspiration. Wow I love this story. I hope that woman knows what a positive impact she made with her comment! Great quote! It's a great reminder to someone that we all need to encourage each other, not tear each other down - no point in that.